December 7th 1941, a day that shall live in infamy. This attack was a start of Americans being scared of Americans. 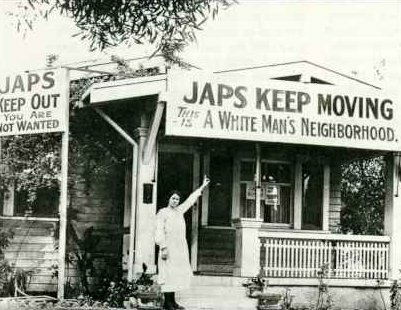 Because the Japanese attacked the U.S., Americans assumed all Japanese must somehow be evil and placed them into internment camps for the length of the war. What if today a small group of individuals did something horribly wrong and we blamed the entire race or group? We took their property and rights away and jailed them for simply being themselves. They couldn’t help being that way. It was nothing they could change and no matter how long they had lived in America they were treated as if they were the enemy. If something like that happened today, would we stand up for those oppressed, agree with the oppressors or keep silent? History is full of people being oppressed because of a few people doing something wrong. In the past decade Americans have learned to hate all Muslims because of 9-11. Americans throw out hate towards those on welfare because of a few that abuse it. We spew out hated words against illegal aliens because they don’t come here legally but the government sure doesn’t make it easy to come here. By the way our ancestors may not have been invited either. If you are like me and your ancestors came from Europe then it is quite possible that your ancestors and mine conquered the land, driving the Native Americans away and killing many in the process. I bet if you were to talk to many illegal aliens they would tell you they are here to find a better life. I believe that this bigotry or prejudice comes because of fear. Fear of people who are different. And we all know that “Fear leads to anger. Anger leads to hate. Hate leads to suffering.” (Yoda) We look different, act different, worship different, have different customs etc… Abraham Lincoln once said “Do I not destroy my enemies when I make them my friends?” What if we took that approach instead of the hate/fear approach? It is easier to sit back and condemn others. It is much harder to get to know people and to learn where they come from so that you understand why they believe what they do. I grew up in upstate New York. If I had continued to live there I would not have learned this because I would not have had to learn a lot. From my birth I was taught what people living in my area believed. There was no big culture difference from family to family. But then I moved to Indiana and then to Ohio. I moved from the country to the suburbs. To different cultures to people who were different. Not because one was better than another, but simply different. Today I have friends that are white, black, Jewish, Christian, agnostic, Atheist, homosexual, heterosexual, young and old. Some have money and some do not. I also have many female friends but that may be because I teach and there are certainly more females in that profession. Wherever I have gone I have been able to make friends. I think mostly because I have learned to listen to them. In college, people I barely knew would ask to talk to me about their problems and I always took time to listen to them. Most of the time I felt like I had no idea how to help them, but they always thanked me for listening. Think about what kind of difference we could make in this world by taking time out of our day to get to know those who are different from us. What if we were to listen to their problems, not to fix them but just to be there for that person? I bet we would find that no matter what religion we followed, what race we were, what areas we grew up in that we would not be that much different. Try it, you might actually like it. And others.